The international conference of 29th April in Jerusalem sparked a discussion around the figure of Pope John XXIII, great friend of the Jewish people, active during the Shoah in the rescue of the Jews from the persecution. We talked with Baruch Tenembaum, founder of the International Raoul Wallenberg Foundation, who cared a very detailed dossier for the candidature of Roncalli as “Righteous Among the Nation”. Which was the role of Roncalli in the Shoah? What action did he carry out in favor of Jews? Roncalli made extraordinary things to help the persecuted Jews. At first in Turkey, then in Bulgaria and France, he fought for saving them from the extermination. For example in Istanbul he helped Jews by giving them certificates of conversion and by trying to obtain informations about the Nazi advance in the European countries. In Turkey everyday passed ships full of Jewish refugees, and Roncalli went to the harbor to visit them and give them some optimism. Lots of Jews obtained by Roncalli certificates of immigration for Palestine, where they escaped and made safe. This action went on in France, after his designation as nuncio in Paris. Nazis were deporting the French Jews, but Roncalli fought for assisting them. We can not forget his work in favor of the establishment of the State of Israel. In Rome, in fact, he helped Moshe Sneh, the Jewish Agency representative, on the occasion of the vote for the United Nations resolution about the plan of partition. Following what Sneh told his assistant Zaban, Roncalli persuaded the Secretary of State of the Vatican, Cardinal Tardini, to make pressure on the Latin America so as the countries vote in favor of the resolution for the creation of the State of Israel. Which was the connection of Roncalli with the Jewish community during his papacy? Roncalli is the best pope for the Jewish community that the Catholic Church have never had. When he became Pope, Roncalli called the Second Vatican Council, in which he ordered to remove negative expressions towards the Jews. The most famous act is the elimination from the Good Friday Prayer of the sentence “perfidious Jews”. 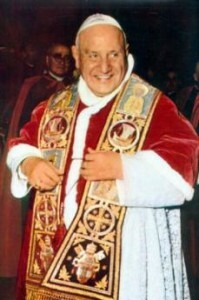 And when in October 1961 a delegation of American Jews came to the Vatican to thank him for the initiative of relieving the Catholic liturgy from the offensive sentences against the Jews, it had been welcomed with the embrace of Roncalli and with his famous words: “I am Joseph, your brother”. Well, his name was Joseph, but with this sentence he wanted to remember the moment in which Joseph, Jacob’s son, met again with his brothers in Egypt. So Roncalli, evoking this story, demonstrated to be a great friend of the Jews. And the new Pope Francis, that I know personally, will surely follow the path that Roncalli started. We know that in 2011 the International Raoul Wallenberg Foundation submitted to Yad Vashem a dossier for the candidacy of Angelo Roncalli as Righteous Among the Nations. Did you get any official reply? No, they only said that Roncalli does not satisfy the conditions for the bestowal of the Righteous Among the Nations title. We know that there are definite criteria in the judgement of the candidacies – especially of diplomats – but we think that Roncalli has all the requisites to receive this title. At the conference of 29th April in Jerusalem we reaffirmed the importance of his activity in favor of the Jewish community. All the Jews have with him a great debt of gratitude and we, as an organization dedicated to people who saved people, think it is important his acknowledgement as Righteous Among the Nations. And we are not the only ones who affirm that: also the son of the Rabbi Herzog, diplomat and Rabbi himself, wrote that Roncalli has to be considered a Righteous. However, our request to Yad Vashem is still pending. We suspect that is the fact that, according to them, in his action as Pope, religious chief and Head of State Roncalli did not act against his superior, that slows the acknowledgement as Righteous. How did the Holy See looked at Roncalli’s action in favor of Jews and his relation with the Jewish Agency? As I told earlier, John XXIII had an excellent relationship with the members of the Jewish Agency. However we can not know the position of the Holy See on this topic. Someone asks if Roncalli acted at the instance of Pope Pius XXII. And I imagine this is one of the elements that emerged in the evaluation on John XXIII of Yad Vashem, that is very critical on the figure of his predecessor.